A regional daily has vowed to fight on after health chiefs voted to shut an accident and emergency department it campaigned to save. The Huddersfield Daily Examiner says it will continue its ‘Save HRI A&E’ campaign, which began back in January. 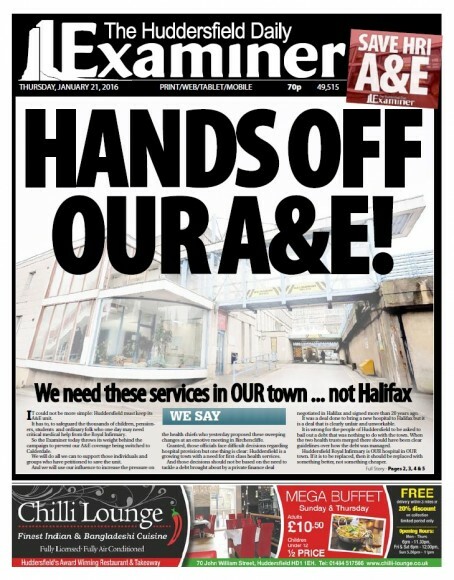 As HTFP previously reported, the Examiner launched the campaign after NHS Clinical Commissioning Groups which run health services in the area announced the plan, which it said would save £240m. The CCGs voted in favour of the plan last week, but Dave Himelfield, the newspaper’s acting health reporter, says the fight is far from over. He told HTFP: “We feel there were far too many holes in the CCGs’ plan for it to proceed yesterday and the whole thing on Thursday felt like a fait accompli. “I was genuinely surprised the CCGs passed the plan almost instantaneously having just discussed a litany of serious concerns with it. “A scrutiny committee still has the option of referring this plan to an independent reconfiguration panel which we hope they do. “There is also the potential option of a judicial review and the possibility of the health chiefs behind the plan being removed from their positions.